I waited for the situation to become clear before saying anything on this, as it got a little…ugly. Last night, the team behind Metro Exodus announced the change saying that "the digital PC version of Metro Exodus will now be available to purchase solely through EpicGames.com". In their official announcement, nothing about it being a timed exclusive was mentioned and so a lot of people were left quite unhappy. Soon after this, the Metro team put up an announcement on Steam where it does actually mention that Metro Exodus will come back to Steam "after 14th February 2020". To do this so close to release, feels really off. I've seen a lot of arguments both for and against the Epic Store across the net, with wildly varying opinions on each side of the argument. For gamers, competition between stores can be a really good and helpful thing and we all know Steam could do with a little competition. Valve have dragged their heels on so many things over the years, I firmly hope this is a good kick up their backside to do better. However, the way Epic is going about it leaves a really bad taste in my mouth. I don't think forcing and annoying people into using another launcher is a good way to go, at all. Rather than compete on customer service, value for money, features and so on Epic are forcing people to look at them. For developers, the short-term gain might be good but do they really, honestly, expect the free to play Fortnite audience which is Epic's bread and butter to translate into sales for AAA games? I've become a lot more sceptical of this recently and I think it's largely the reason Epic is throwing money around to try and force a change. As Epic Games continue throwing money at developers and publishers, I expect things to get even uglier as the year goes on. For us, it's not a good thing, as time and time again Epic Games have shown how little they care about Linux (we're not even on the damn roadmap) and that's sad as we will be the ones losing out. For Valve, the more they lose like this the quicker they will need to react. I'm going to end up sounding like a broken record here, but they need to seriously get back into their own IP. Half-Life, Left 4 Dead, Portal and so on. Especially after Artifact basically failed them, although they again said they're "Still in it for the long haul" in the most recent update to it. Not just that, reducing their cut from developers may be inevitable too, it would certainly show they understand the market is changing considering how many developers feel Steam's 30% cut isn't worth it. The most recent "GDC State of the Industry report" showed that only six percent of developers thought Valve were doing enough for it. I don't think Valve need to match Epic on the cut either given how popular Steam already is, even a 5% reduction could be massive for smaller developers. Linux gamers might think differently on that point though, since Valve help to fund various open source projects and that would likely reduce their ability or enthusiasm to do so. We're not a big enough audience for them to put more of their eggs in our basket—yet. No matter what happens, I can't imagine Valve just rolling over and allowing Epic to set up shop on their lawn. I'm very curious to see what they have up their sleeves. A competitive Steam is good for everyone! 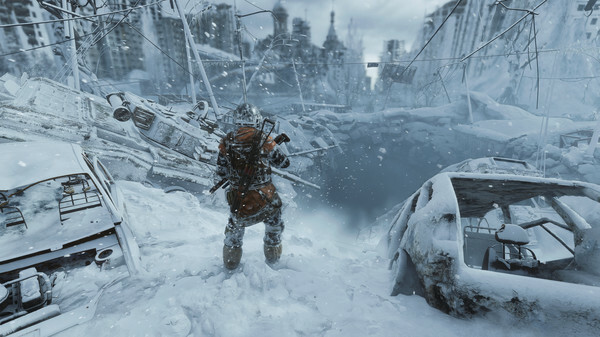 At least by the time Metro Exodus comes back to Steam, we will see if they made any sort of decision on Linux support (as they currently won't say—likely a no). If not, that's a long time for Steam Play to mature for those who use it. Quote For developers, the short-term gain might be good but do they really, honestly, expect the free to play Fortnite audience which is Epic's bread and butter to translate into sales for AAA games? This method works very well for Sony on Playstation. Tencent turning up the heat! Thing is, judging by the wave of angry comments on the Steam page, 4A Games / Deep Silver seem to have hurt it's Metro fan base. Really bad move to pull it off like that, 2 weeks before release after having built such a hype for it. We now have a full year to discover if it's a good game. Who knows, we might have saved 60$. Mohandevir Thing is, judging by the wave of angry comments on the Steam page, 4A Games / Deep Silver seem to have hurt it's Metro fan base. Really bad move to pull it off like that, 2 weeks before release after having built such a hype for it. We now have a full year to discover if it's a good game. Who knows, we might have saved 60$. It was on #1 of the top sellers on Steam yesterday for a while. Don't know where it was before the announcement, but you could still buy it. Looks like a lot of people quickly bought it, so they can already have it on Steam instead of having to switch to EGS. For me it's simple: competition is fine, exclusivity is not. There's no reason why they couldn't offer the game on both stores at the same time. That would be competition. I'll buy it in 2020 on Steam, so that Deep Silver knows where I am as a customer. This is a critical time to buy from Steam to fully support Valve. It's imperative for Valve to win for us to continue to truly make strides in the gaming scene. Will we exist if Valve doesn't win? Probably to some degree. Will we advance as we have been? I can't see any way that would be possible without Valves push and dollars making our platform better. That screenshot made me wish Deadspace II would come to Linux. Frankly, I don't think Epic wants to better the situation, they just want to be the ones benefiting instead of Valve. I said it before: I think exclusivity is fundamentally bad. That goes for availability and stores just as it goes for platforms, operating systems and architectures. What we need is radical portability and availability.